On July 17, 1944, before the unveiling of the first atom bombs, a horrendous explosion happened 30 miles north of San Francisco, a mile away from the town of Port Chicago, California. The explosion vaporized one navy ship and destroyed another and killed 320 men who were tasked with loading munitions onto the two ships. Much speculation has taken place in the more than seventy years since it happened, and there is still no official cause for the disaster, World War II's worst home-front disaster. The Naval Ammunition Depot at Port Chicago, California was one of the main hubs of ammunition during World War II for the Pacific Theater. It is located 30 miles northeast of San Francisco close to Mare Island in Vallejo, California. The town, which is approximately a mile from the munitions depot, had a population of about 1,500. The site was used as a shipyard during World War I, and became a depot shortly after the attack on Pearl Harbor. In 1942, the military service in the United States was still segregated, and in the Navy, black sailors were not involved in sea duty. During that time, there were approximately 1,400 black enlisted men, 71 white officers, 106 marines who were serving as guards, and 230 civilian employees at Port Chicago. The main job of the enlisted men was to unload ammunition from the railroad boxcars which brought them to Port Chicago and load them into a hatch via cargo nets. The ammunition was said to include incendiary bombs, depth charges, small caliber bullets, and large bombs which weighed up to a ton. This loading went on 24 hours a day, and was done by men who had no special training in handling ammunition. There was widespread concern about the safety of the men, but they were told by their commanding officers that the munitions were not active and would not explode. On July 17, 1944, there were two ships being loaded at the port, the SS E.A. Bryan, which was packed with 4,600 tons of explosives and ammo, and the SS Quinault Victory, which the men were in the process of loading 430 tons of bombs. There were 98 enlisted black men, 13 naval guards, and 31 merchant marine crewmen working on the Bryan and 100 black men, 36 crewmen, and 17 naval armed guard working on the Quinault Victory. At 10:18 that night, an explosion was heard up to 200 miles away. An Air Force plane flew over Port Chicago, at about 9,000 feet. They reported that they saw pieces of white hot metal, some as big as a house, fly straight up in front of them. The co-pilot described it as "a fireworks display" which lasted approximately a minute. The SS E.A. Bryan was vaporized, and 320 men on the pier with it were killed instantly. Not a single identifiable piece of the ship was ever found. Only 51 bodies could be identified, and some of them were found more than a mile away from the pier. 202 of the dead and 233 injured were African-Americans, and this one incident was 15% of all African-American naval casualties in the entire war. The stern of the SS Quinault Victory was moved more than 500 yards from where it sat before the explosion. The rest of the vessel was in pieces, the ship having been lifted out of the water entirely. The Napa Journal reported the next day, "The hills of the Napa Valley were momentarily illuminated by sunlight." The St. Helena Star quoted an eye witness who happened to be standing in front of him home. The witness, Tom Street, was quoted as saying, "First there was a sudden mushroom of white light, followed an instant later by another, then a few moments later the intense roar and the concussion of the blast." Clocks in the town of Port Chicago, more than a mile away, were stopped at 10:19, and not a single building in town was undamaged. The Richter scale registered as 3.5 in Bonner's Ferry, Nevada. Strangely, the head of Port Chicago, Captain William J. Parsons, who had been stationed at Los Alamos Laboratories before being transferred to Port Chicago just before the disaster was promoted to commodore directly following the disaster. He went on to direct the tests in the Pacific, including the Bikini test. He was instrumental in designing and implementing the first atom bomb, working directly under Dr. Oppenheimer. He was also the bombing officer on board the Enola Gay when it dropped the atom bomb on Hiroshima. A month later, hundreds of enlisted men, including several injured in the explosion, refused to load ammunition due to the fact that nothing about the handling of the bombs had changed. More than 200 of them were convicted of disobeying orders in a summary court martial. Each of them forfeited his pay for three months, and several of them were witnesses in the mutiny trials which would happen shortly. The rest of them were shipped to various places in the Pacific Theater, where they were assigned menial jobs like cleaning latrines and picking up cigarette butts and garbage. Upon their return stateside, they were each given bad conduct discharges and denied all veterans' benefits. Fifty of them were tried for mutiny, which carries a maximum punishment of death. In their courts martial, they indicated that they had not been ordered to load the ammo, but were simply asked if they wanted to load ammunition. All 50 of them were found guilty of mutiny and sentenced to 15 years. In 1946, forty-seven of the prisoners were released from prison but were made to remain in the Navy on probation. They were all sent to the South Pacific and slowly, a few at a time, were dishonorably discharged. Port Chicago is no longer in existence, having been expanded and renamed the Concord Naval Weapons Station. The explosion was looked into in depth by a team from the Manhattan Project, and given eye witness reports such as those describing a "ball of fire mushroom" and "...that literally filled the sky with flame," it was thought that the explosion may have been caused by a nuclear bomb, specifically a low-yield atomic bomb. That idea still exists today. It is backed up by numerous facts, garnered from different places. Documents from Los Alamos indicate that at the time of the Port Chicago detonation, scientists embraced what was then called the Hydrodynamic Theory of Surface Explosion, which posited that the only potential delivery device for an atomic bomb was a ship, which would have to be detonated in a harbor. The navy photographed the entire explosion from across the bay, and records of the contents of the box cars which were being unloaded at the pier and loaded onto the ships is missing. Records for all other cars on the train were intact. Theorists believe that the 9000-pound Mark II atom bomb may have been in one of those two cars. Contra Costa County and surrounding towns and counties including Alameda, Santa Clara, and San Mateo have had abnormally high cancer rates since the mid-1940s, though those rates have dropped in the past few years. Still, more than 70 years after the event, what actually happened to cause the detonation of whatever it was which caused this disaster is anybody's guess. Dissects the events which resulted in the vaporization of one ship, the demolition of another, the deaths of 320 men, and the mushroom cloud which indicated to many that this was the first nuclear blast in history. Contains a video news reel of the explosion at Port Chicago, along with the news which puts it in context. Displays photographs and descriptions of the disaster and the resultant damage. Also links to a Frequently Asked Questions section specifically about that disaster. Shares information about the worst World War II-era disaster in the homeland, including photographs, background about the segregated military, an explanation why the vast majority of those who were killed were African-American, and a list of the dead, their positions in the Navy, hometowns, and ages when known. Chronicles the 1944 explosion which took place in San Francisco Bay and presents the evidence which the author says points to that explosion being the first nuclear bomb, accidentally detonated at the Navy dock at Port Chicago. Provides the results of the author's investigation, lasting more than twenty years, of the 1944 explosion at the Port Chicago Naval Magazine. This site covers the entire history of the explosion and also documents the connections between this tragedy and the Manhattan Project and Los Alamos, where the atom bomb was being assembled. 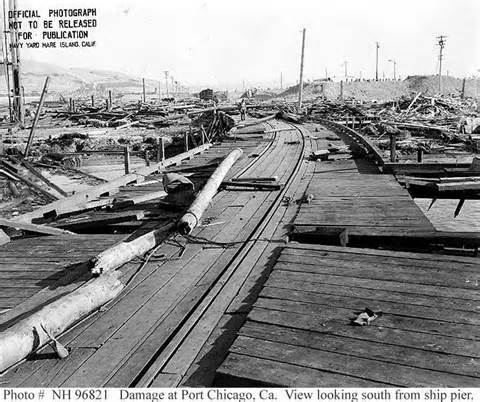 Search for Disaster at Port Chicago on Google, Bing, or Yahoo!